Sorted, suggest you read the rules too. i'm replacing the m900 front mech on my alpinestars with an xt item and wondered what these m900 ones were worth ? i hear there pretty rare ? Got a chainset which came with my Muni-Mula, cranks are run of the mill Deore LX M563, but the chainrings are all Talon red anodised - 42,32,22.. Pics..
Any ideas as to their value? I bought a new Talon like these off t'interweb for (I think) about £8, but that wasn't red! If they're in as good condition as it looks in the pic, maybe £25 for the set? 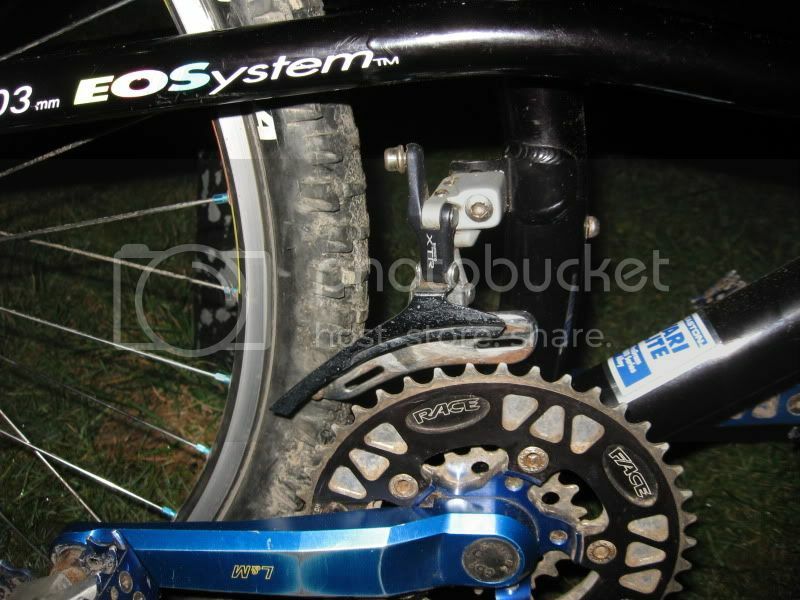 £35 with the cranks? Obviously get some more opinion before relying on that though! Specialized SWorks FSR frame, 1995ish, a few scratches and stone chips, needs new bushes but I have a complete NOS set included? Specialized SWorks steel, 1994ish, complete bike, mostly original. 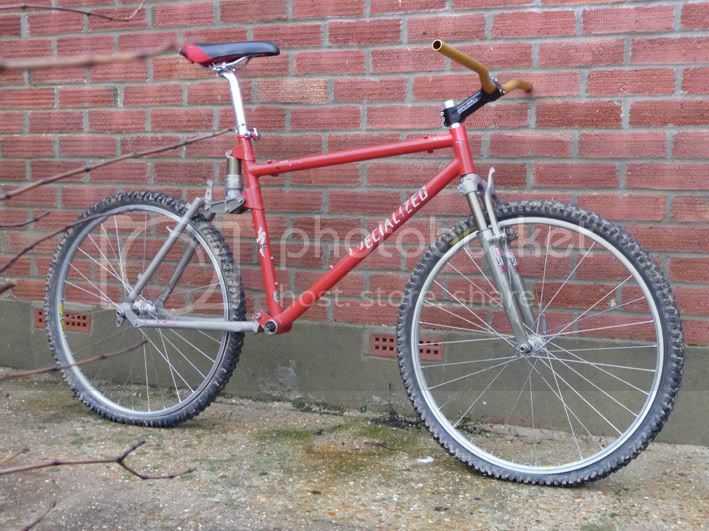 Specialized Ground Control A1M 1996, frame and Quadra 21R Forks, seatpost, stem, bars, front mech, excellent condition. Pair of Hope XC TiGlide hubs with Bontrager Red and Blue Spot rims. Pair of LX Hubs Mavic M231 rims, 93ish. Bontrager Privateer, 1inch headtube (not sure if this is a Bonty or Trek model) seatpost, stem, lx chainset. Late Mag21's, silver, excellent condition, 1 inch threaded. LX STi Brake Shifter combo, M567, front and rear, 8sp, NOS. 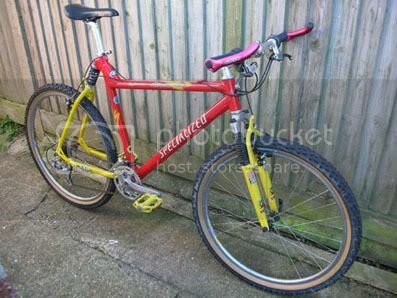 88/89 Rockhopper, complete, ok but maybe just a pub bike, I thought £25 for this? Oh, I think I've posted some of this stuff before so might have some photos I can put up later? Last edited by Hermit on Fri Feb 25, 2011 9:21 pm, edited 1 time in total. Should be around £100 if everything's in good condition? I might be interested in this! Also interested in this for a friend if it's smallish? The privateer is a medium, but comes up quite small, and I think the Rockhopper is a 19 inch, I'd be reluctant to post the Rockhopper as I think it's not worth much but your welcome to pick up from East Sussex? I think I might just have to guess at some prices and negiotiate, I haven't done any research on here, or ebay, for price guides yet. Nice orange set of Salsa Cycles Arc de Tri-oomph brake boosters.